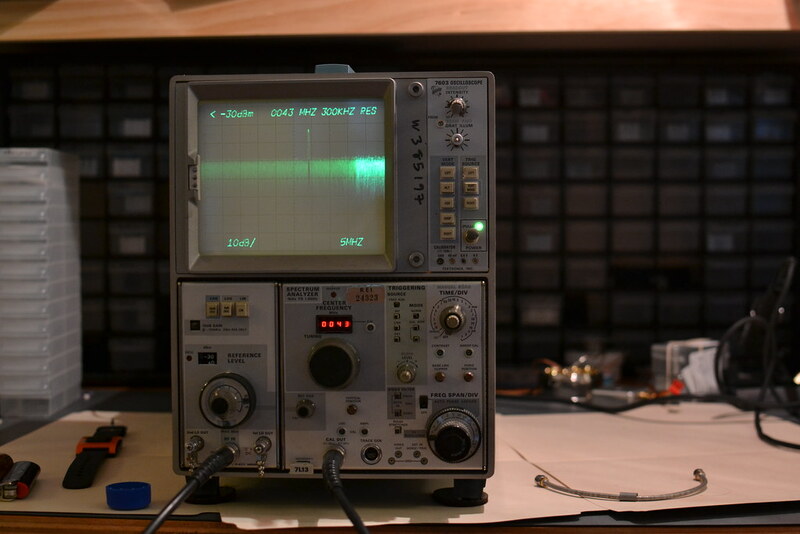 Part of my lab build out was to assemble the missing pieces of my test equipment collection. I had already found a 7104 1GHz scope with plugins, so I was mostly set for normal analog signals, but I was trying to work at S-band, which even my spectrum analyzer didn’t cover. I ended up becoming enamored with the plugin concept embodied by the Tek 7000 series, so I started looking for the 7S/7T sampling plugins. These plugins accept their own plugins in the form of sampling heads. Depending on the risetime of the pulse generator circuit in the head, these allow viewing repetitive waveforms up to 12.4GHz. I had to have one. I found a 7S12 with S-6 head (11.5GHz) and S-52 pulser for a reasonable(?!) price on eBay. It was untested but looked clean and I had just “fixed” the 7104 a few days prior by re-seating a TO-8 IC, so I had high hopes I’d be able to salvage this guy as well. I was pleasantly surprised when I got the scope that it had been correctly packaged. This was the third piece of used test equipment I’d gotten off eBay and the first two had suffered damage to knobs and enclosure due to the sellers underestimating A) how heavy the damn things are and B) how rough our package handlers are. Ironically, the scope had had a few knobs broken off – that was part of the reason it went for as little as it did. to set it aside. Doing so I was greeted with an unpleasant sticky situation – literally. The bottom outer rail of the plugin was covered with an unidentifiable sticky brown liquid - best guess is ancient cola. 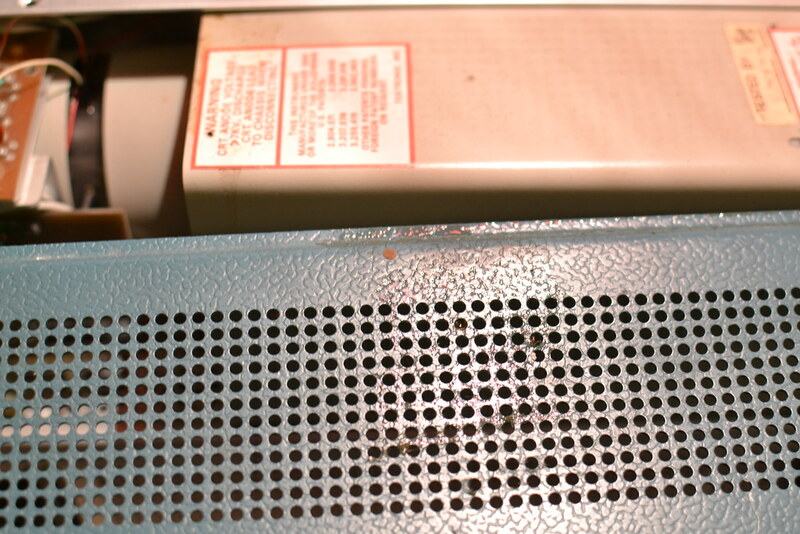 Sure enough, a close look at the ventilation holes on the top of the case revealed the ingress point. Ruh-roh indeed. The plugin looked OK, but was sticky underneath. I looked around and didn’t find a pool of liquid anywhere, so I went ahead and plugged the scope in on it’s own surge protector, and pulled the power knob. Nada. Zip. Zero. Nothing. No power indicator light, no graticule illum., so hum, no nothing. Time to pull the covers. I have to give credit to Tektronix for good documentation. Every manual I’ve seen from them has start-up, calibration, and at least basic service information. Not having to track down a separate, rare, unpublished service manual is a major bonus in my book. 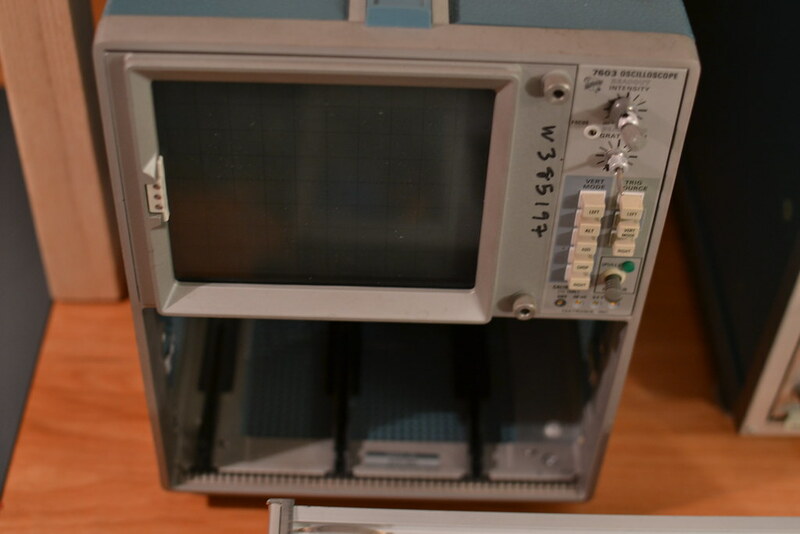 Once the covers were off, I noticed a second major design choice that allowed ease of service - essentially all the low-voltage circuits were mounted exterior to any shielding necessary for the HV circuts. Additionally, they are labeled and interconnected with ribbon cables that are long enough to stay attached even when the boards are unmounted for debug and service. This was a huge help. Alright, so we start with the power supply. Obviously simple things like the indicator lights aren’t getting power, so let’s see why not. 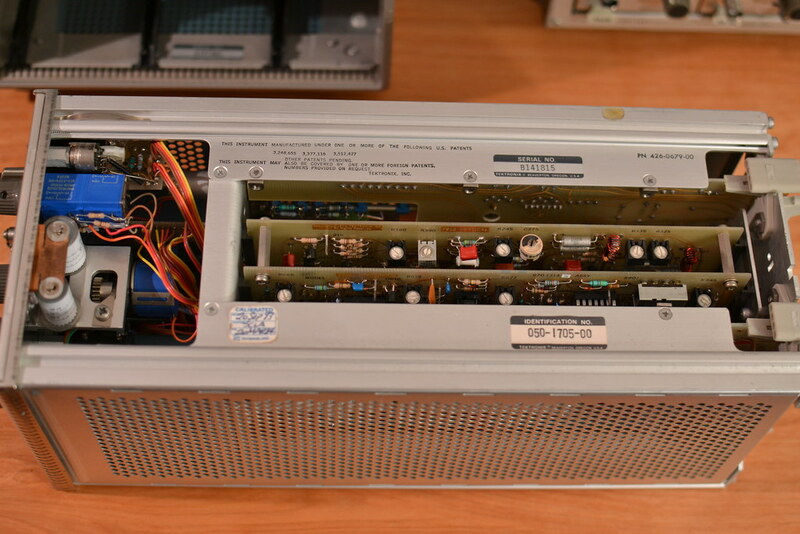 The 3-slot 7000 series mainframes generally have linear power supplies, with a separate transformer/rectifier section and regulator board. I slid the rectifier section out first, before realizing it was more likely the regulator board with it’s associated power NPNs was a better (worse?) failure candidate. Disconnecting the regulator from the rectifier showed correct function of the full-wave rectifiers and filter caps, which I was particularly worried about because they are giant metal can suckers, and would be a bear to replace. Onto the regulator board. The voltages output include +130V which measured ~+78V, +50V measured 16, and none of the negative voltages were less than 0V. Clearly something was shorting somewhere. Unplugging all loads via ribbon cabling showed the regulators themselves were working correctly, so the short was downstream. 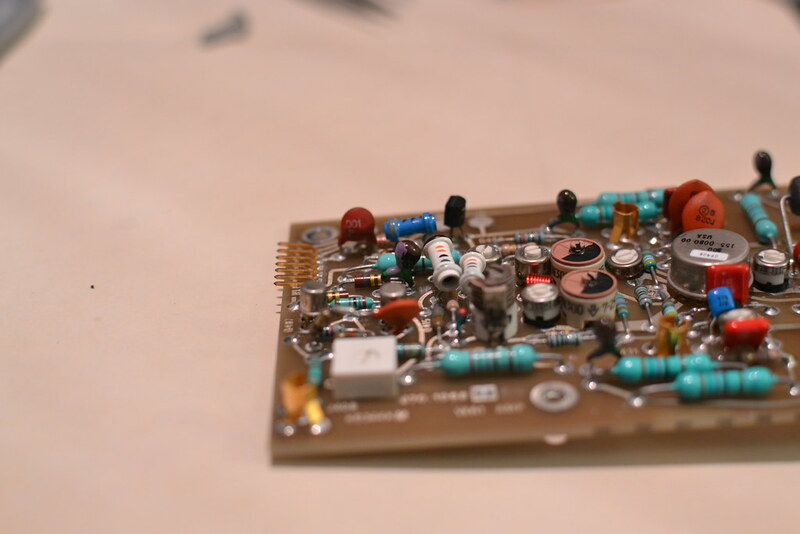 I eventually isolated the short to the X-axis amplifier board. 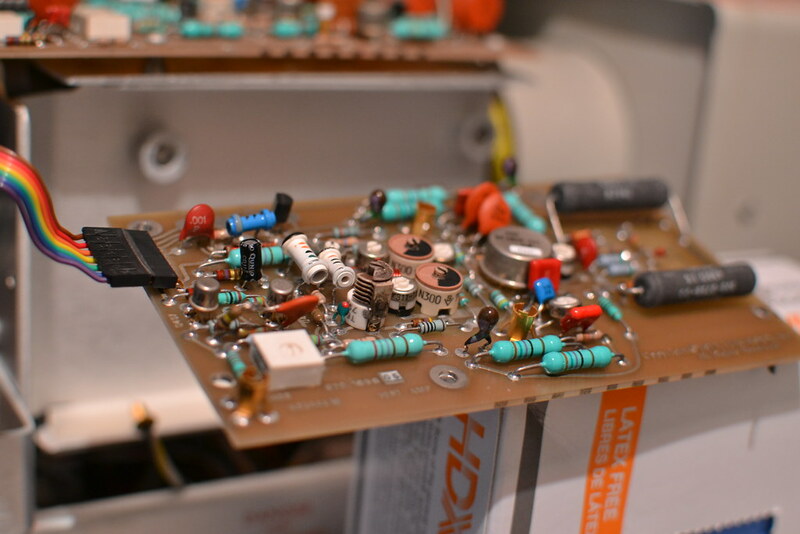 Since this connects directly to the CRT deflection plates, I was somewhat relieved when the short I found between -50V and ground remained when I removed the board entirely. I was not excited to source and replace the CRT. Taking a look at the schematic revealed a 1uF capacitor between -50V and GND. In fact, this was the only rail that had a cap directly to ground, the other voltages having multiple transistors or resistive dividers making a simple short unlikely. I took a gamble and snipped the leads of the cap, resulting in a more reasonable 18kOhm between -50V and GND. The cap by itself measured about an Ohm. Bad cap. Bad cap, good color scheme. Qunlo brand replacement. Not my first choice, but it’s what I had on hand. Soldering in a Radioshack 1uF 50V cap replacement later, and all the voltages measured within 1% of nominal. Plugged everything back in and with fingers crossed I pulled the knob. Green light! Graticule Illumination! Big Smile! I had to pull the 7L13 plugin from my other 7603 to be sure the CRT was working correctly as I still didn’t understand the sampling operation. Sure enough, everything was good to go. I cleaned up some of the brown spill and closed her back up. Success.